Williamscraig Holiday Cottages has won "Best Tourism Business Award" at the West Lothian Business Excellence Awards 2018. The award was to recognises a business that demonstrates all-round excellence and helps make West Lothian a first-choice destination. Our Cottages are all below, we now have super fast Fiber Internet. Visit Scotland have awarded us a 4 star rating. We are a family owned and run business based near the historic town of Linlithgow, only 17 miles by motorway to the centre of Edinburgh, or 18 minutes by train from Linlithgow which is only one and a half miles away. Rose Cottage, Appletree Cottage and Honeysuckle Cottage are recently converted stone agricultural buildings, now comfortable and stylish self-catering holiday accommodation. We have since built four more fabulous new cottages that you are sure to love, in one of the cosiest retreats with the one of best views in the land. They are now available for booking, there are some pictures on the Gallery or click on the images below for more photos and information. The cottages have 3 to 6 bedrooms and each has a separate mezzanine area with double sofa bed, ideal for families or couples coming together. All 7 cottages are of the same spacious amazing award-winning designs. All of the cottages have hot tubs and a Badger Cam, trained on a local badger set, which is very popular with our visitors. We have also got two cameras on a half acre pond and a bird feeder where we have greater spotted woodpeckers visit daily. Here are a couple of cam samples; mummy badger having a good scratch, with two baby's, or Kittens and a couple of woodpeckers, adult feeding a juvenile. Each of the cottages has its own picnic table and wood burning stove. We also have free Super Fast Fiber Broad Band WiFi. Click on the images below to see details of each property. Rose Cottage has 3 bedrooms, the master bedroom with a 4 poster bed and en-suite shower room. The second bedroom has a king size bed and the third bedroom has twin beds. In addition there is a double sofa bed on the mezzanine level. Rose Cottage has a hot tub and a Badger Cam. Honeysuckle Cottage has 3 bedrooms, the master bedroom with an en-suite shower room. The second bedroom has a king size bed and the third bedroom has twin beds. In addition there is a double sofa bed on the mezzanine level. Honeysuckle Cottage has a hot tub and a Badger Cam. Appletree Cottage has 3 bedrooms, the master bedroom with an en-suite shower room. The second bedroom has a king size bed and the third bedroom has twin beds. In addition there is a double sofa bed on the mezzanine level. 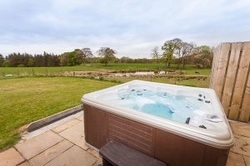 Appletree Cottage has a hot tub and a Badger Cam. 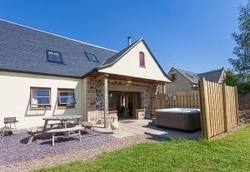 Laurel Cottage has 3 bedrooms, the master bedroom with an en-suite shower room. The second bedroom has a king size bed and the third bedroom has twin beds. In addition there is a double sofa bed on the mezzanine level. 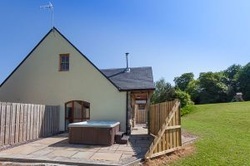 Laurel Cottage has a hot tub and a Badger Cam. ​Beech Cottage has 3 bedrooms, the master bedroom with an en-suite shower room. The second bedroom has a king size bed and the third bedroom has twin beds. In addition there is a double sofa bed on the mezzanine level. 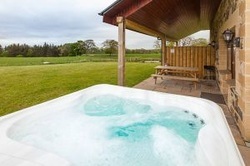 Beech Cottage has a hot tub and a Badger Cam. 1 Eden Cottage has 3 bedrooms, the master bedroom is huge with a king size bed, an additional single bed and an en-suite shower room. The second and third bedrooms have twin beds. There is a lockable, fire-proof partition between 1 Eden Cottage and 2 Eden Cottage. This means they can be rented separately as self-contained 3 bedroom cottage, or together as one enormous 6 bedroom cottage. 1 Eden has a hot tub and a Badger Cam. 2 Eden Cottage has 3 bedrooms, the master bedroom is huge with a king size bed, an additional single bed and en-suite shower room. The second bedroom has twin beds. There is a lockable, fire-proof partition between 1 Eden Cottage and 2 Eden Cottage. This means they can be rented separately as self-contained 3 bedroom cottages, or together as one enormous 6 bedroom cottage. 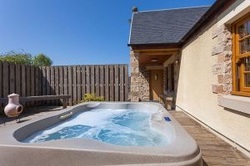 2 Eden Cottage has a hot tub and a Badger Cam. This modern ground floor apartment with a double bedroom is ideal for 2 and can sleep up to 4 if using the sofa bed. Bathroom has bath with shower over. There is an open plan living area with kitchen diner. The apartment is located in Linlithgow, handy for the shops and historic Palace and just a mile from the train station for easy travel into Edinburgh or Glasgow. 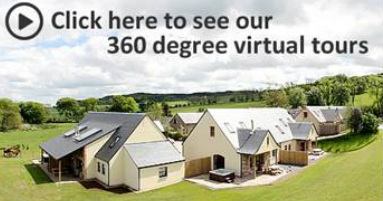 This modern cottage sleeps 6 with two double bedrooms and one twin bedroom. The master bedroom has ensuite and there are two further bath/shower rooms. There is an open plan living area with kitchen and full size dining table. The cottage is situated in an elevated position in the heart of Scotland with stunning panoramic views of the open countryside. If you're coming on a family holiday to Linlithgow, what could be better than being able to tell the kids to play on the swings whilst you pack lunch and load up the car for the day? 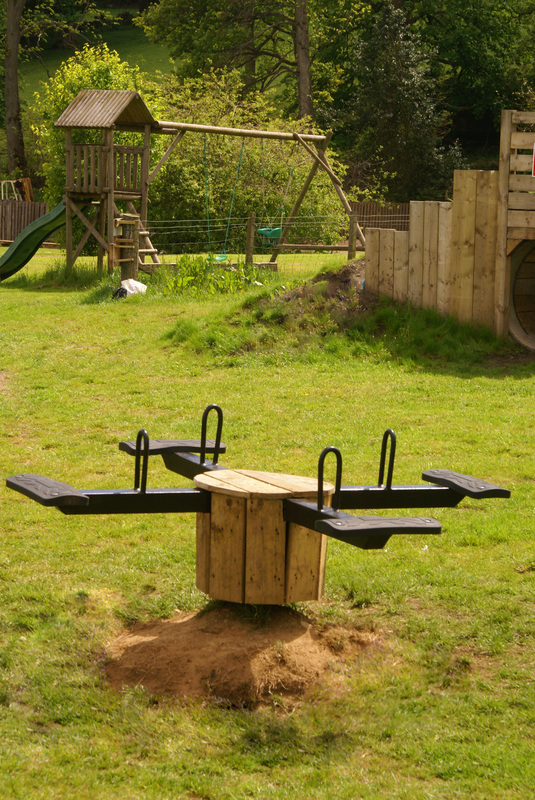 Our fantastic swing park is on a large area all within eyesight of the cottages and includes a four way see-saw, a flying fox, and a variety of slides and swings! There is also a smaller playset for younger children - so there's something for all ages! "The kids really like it and parents love it". Want to try your hand at something a bit different? We now offer knife and axe throwing lessons. You will be given guidance on safety and technique and it's surprisingly good fun. Want a Holiday from Cooking? Marilyn from Our Kitchen to Yours can prepare and deliver your meal so it just needs to be defrosted and heated in the oven - and she will even do the washing up afterwards, at a very reasonable price (for the girl groups Marilyn can also supply male butlers). Or Tesco and Sainsbury`s also deliver to the door. Fancy an entertaining tour round Linlithgow? Try www.marysmeanders.co.uk. This is an ideal activity for a family, it is one and a half hours long, and very light hearted. Linlithgow was established around the twelve hundreds, and boasts of being the jewel in the crown of West Lothian, Mary queen of Scots was born here in Linlithgow palace, over 500 years ago, which is well worth a visit for all the family. It has some of the old cobbled streets, with quirky old houses that look squint at a distance, and much worse close up. There is a loch next to the palace, which is a nice tranquil two and a half mile walk round it, with a standard stop off at the Italian ice cream shop, which is not to be missed. The canal goes right through the centre of the town, and why not take a canal boat and head straight to the Falkirk wheel passed the Helix park on a 4 hour journey. It has a good variety of restaurants, takeaways and pubs including the famous Four Marys Pub. It's only 18 minutes by train to Edinburgh and the train runs every 15 minutes. There are regular train services to Stirling, Glasgow and Falkirk as well. There are many beautiful, tranquil walks in the immediate area including a direct path to Cockleroy and Cairnpapple Hills where there once stood ancient henges and forts. These hills have excellent mountain bike tracks. There is an abundance of wildlife and over eighty different types of birds. Linlithgow Golf Course is next door, visitors are most welcome and can pay half price on the golf course through the week through ourselves. There is a public bar and restaurant at the golf club which you are welcome to use. There are two fishing lochs nearby one of which, Bowden Springs Fishery, offers a discount to our residents. Linlithgow Leisure Centre is one mile away with a gym, swimming pool and soft play. A local therapist at Audrey's Beauty Box can look after your every beauty needs on 07854 015 956 is recommended for therapeutic massage, leg wax, or eyelash tint..
You can find many visitor attractions and outdoor activities in the area to make your holiday special. Please see our Local Attractions page for more information or visit Linlithgow's own website, www.linlithgow.com. "We stayed here for 4 days and nights in Feb, my sister was getting married at The Vu and we all got ready here including the bride. It was a magical place to stay with breathtaking views and a warm atmosphere. The house is massive with lots of room and everything you could need. It is designed to be a house for a family in that the commual area is connected to all the bedrooms etc. We loved it!!!! Findlay popped around a few times and even helped us with how to put kilts on." Williamscraig is a beautiful setting for photographing family events and just a few minutes' drive from romantic wedding venues such as Linlithgow Palace, Linlithgow Burgh Halls and The Vu, Bathgate. 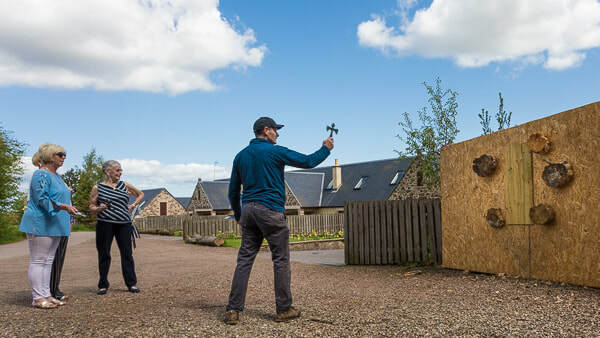 Williamscraig Holiday Cottages was awarded the Best Tourism Business in West Lothian in the Business categories at the West Lothian Chamber of Commerce Awards.